Today I wanted to speak about something that affects all of us, but we all react totally differently to and that is stress. It can be the smallest thing or the biggest thing but it can affect every single person in a totally different way and it can be really hard to know how to deal with that stress which be caused by anything from work or finances to relationships, friends and family. Sometimes the smallest thing that might seem like nothing to anyone else can really affect you and caused you to feel really uptight and just generally feel quite stress. Stress and anxiety is something that I suffer from. When I start to feel stress my chest starts to feel really heavy, I find it hard to breathe and I just cannot talk to anyone and totally shut myself off from everything and I know in the past I haven't dealt with it well and I just let everything get on top of me. One of the best things I did was to see a therapist not only did i get everything out. I also learnt ways to deal with stress when I find it creeping up on me. 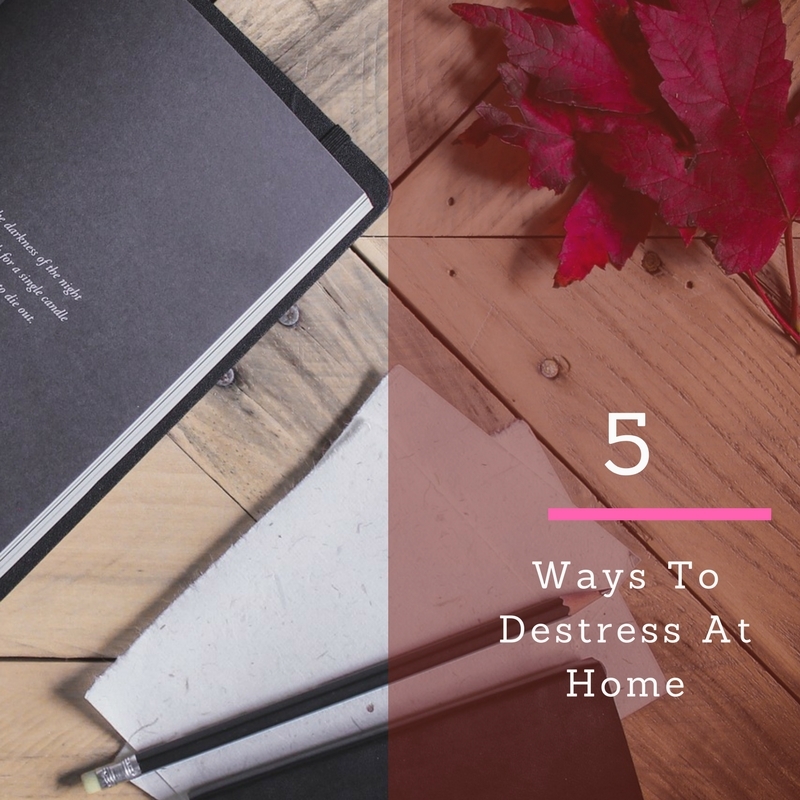 So today I thought I would share some ways I de stress at home. Breathe, most probably one of the most simplest things to do but it is also one of the most effective. When you are stressed you tend to shallow breath so don't breathe the correct way. And it just makes matters worse. Take a moment, sit down and breathe in through your nose and slowly out of your mouth for a few minutes you will notice you feel a lot calmer. Listen to music, it may sound like an obviously thing to do but it really does help to listen to music and calm down. It doesn't matter that type you listen to as long as it calms you down. I like to listen to really calming relaxing music or some old school R&B. Find a hobby, if you have a hobby try to find time when you are feeling stressed to just do that whatever it is. It doesn't really matter as long as you enjoy doing it. I know a lot of us don't actually have a hobby as life takes over. If that's the case try and go out and try new things untill you find that thing that you love doing. Clean, I don't know about you but I love to clean as a way to relax and de stress. I find I totally zone out when I get stuck in to some household chores. It is one of the best stress busters that you can ever imagine. And with the added bonus of a clean house afterwards. Have a bath, a warm bath can help tensed muscles and improve your health and potentially your mental well-being too. I try to have an hour bath at least once a week, just sitting there and enjoying the moment really helps me de stress. So those are some of my tips to de stress at home, if you are in need of some more tips and hints Rattan Direct have produce their own guide on why it is important to de stress at home which you can find here.